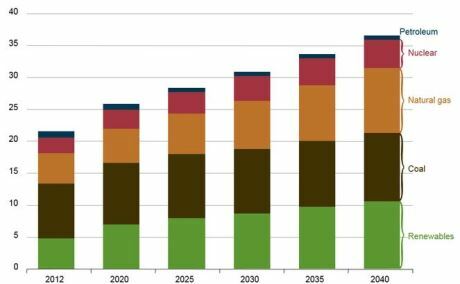 Global nuclear electricity generation is expected to almost double by 2040, according to the latest projection by the US Department of Energy's Energy Information Administration (EIA). Most of this growth will be in the developing world, it said. Releasing the latest edition of its International Energy Outlook yesterday, the EIA said total world energy consumption will increase by almost 50%, from 549 quadrillion British thermal units in 2012 to 815 quadrillion Btu in 2040. This growth will be driven by industrialization in non-OECD countries, especially in Asia, the EIA said. "Developing Asia accounts for more than half of the projected increase in global energy use through 2040," said EIA administrator Adam Sieminski. "This increase will have a profound effect on the development of world energy markets." By 2040, almost two-thirds of the world's primary energy will be consumed in the non-OECD economies, according to the EIA. Although consumption of non-fossil fuels is expected to grow faster than consumption of fossil fuels, fossil fuels will still account for 78% of primary energy in use in 2040. Coal will be the world's slowest growing energy source, rising by 0.6% annually from 153 quadrillion Btu in 2012 to 180 quadrillion Btu in 2040. China, the USA and India will remaining the top three coal-consuming countries, together accounting for more than 70% of world coal use. Natural gas consumption will grow 1.9% annually over the same period. According to the EIA, global electricity generation will increase by 69% between 2012 and 2040, from 21.6 trillion kWh in 2012 to 25.8 trillion kWh in 2020 and 36.5 trillion kWh in 2040. While renewable energy sources are projected to be the world's fastest growing energy source for electricity production between 2012 and 2040, growing an average 2.9% annually, nuclear energy will be the third fastest growing after natural gas. Global nuclear generating capacity is expected to see 2.3% annual growth between 2012 and 2040, from 2.3 trillion kilowatt-hours to 4.5 trillion kWh. Its share of total primary energy over this period will increase from 4% to 6%. "Concerns about energy security and greenhouse gas emissions support the development of new nuclear generating capacity," the EIA said. China alone, which plans to add 139 GWe of nuclear capacity by 2040, accounting for 61% of world nuclear capacity growth. Among OECD countries, only South Korea has a "sizeable increase" in nuclear generating capacity (15 GWe), the EIA notes. However, reactor shutdowns in Canada and Europe, together with reduced capacity in Japan, will see an overall drop of 6 GWe in nuclear capacity in OECD nations by 2040. Despite the move towards lower-carbon energy sources, energy-related CO2 emissions are projected to increase from 32 billion tonnes in 2012 to 36 billion tonnes in 2020 and then to 43 billion tonnes in 2040, a 34% increase from 2012 to 2040. "Much of the growth in emissions is attributed to developing non-OECD nations, many of which continue to rely heavily on fossil fuels to meet the fast-paced growth of energy demand," the EIA said.